The UK is facing a rise in youth unemployment, and it has been claimed recently that there is a link to immigration from Eastern Europe. Can this be backed up or discredited? 8 Youth unemployment in the UK increased by almost 450,000 in the period from 2004 Q1 to 2011 Q3, from 575,000 to 1,016,000. Over the same period, numbers of workers from the A8 countries grew by 600,000. 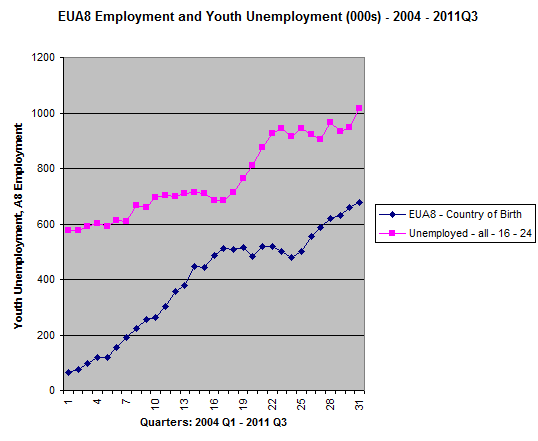 Correlation is not, of course, proof of causation but, given the positive employability characteristics and relative youth of migrants from these countries, it is implausible and counter-intuitive to conclude – as the previous Government and some economists have done - that A8 migration has had virtually no impact on UK youth unemployment in this period. Accurate estimation of the size of the impact is beset with problems of statistical ‘noise’ and more research needs to be done to assess the true scale of the impact. In short, there is probably no link between youth unemployment and immigration but, if there is, MigrationWatch will need to produce a better study to demonstrate the existence of such a link. The trouble with proving anything in economics, which is what this is really about, is that the theory is imperfect and there are many alternative views and theories with too few good experiments to differentiate them. The popular view about why immigration will cause unemployment is based on what most economists agree is a fallacy called the "lump of labour" fallacy. (See the definition on the website of The Economist and this NYT article by Paul Krugman). The basic idea is that there is a fixed pool of work to be done. Therefore, if there are more people, there will be higher unemployment as there won't be enough work to go around. The idea probably goes back to the Luddites who smashed the machines that made factories more efficient apparently threatening their jobs. Most economists think this is nonsense. Observationally, it hasn't happened that way. Since the industrial revolution, the economies of most countries have become immensely more productive as we have replaced people by more productive machines. Yet, most people are not unemployed and most countries are far wealthier than they were in 1850. Higher productivity makes societies wealthier; wealthier societies can afford more goods so there are more jobs. Basically, modern mainstream economics does not agree with the public's intuition. However, theory is rarely enough to settle an argument in economics, where the complications of the real world often lead to observations that are hard to explain in theory. So what do the empirical studies suggest about the UK? The ones that produced the study, MigrationWatch, is a broadly anti-immigration pressure group with the ear of some members of the current government (and this is the study referred to in the question). During the transition period since their accession in May 2004, an estimated 1.6 million workers came to the UK from the new EU Member States. Between the first quarter of 2004 and the third quarter of 2011, employment of workers born in the A8 increased by 600,000. Over the same period the number of unemployed young people in the UK almost doubled, from 575,000 to just over a million. Figure 1 plots the two variables. Is there a causal linkage between the two? concerns were expressed by Professor Rowthorn, Emeritus Professor of Economics at Cambridge University, in evidence to the House of Lords Economic Affairs Committee Inquiry (in 2007/08) into the economic impact of immigration into the UK. He argued that finding effects that are statistically insignificant “does not mean that they are small, it simply means that there is too much noise in the system to estimate them accurately”. These results have been criticised on the grounds that they are counter-intuitive, given the scale of A8 migration into the UK and the characteristics of the migrants. The lump of labour fallacy is very intuitive but few experts would defend it. But what do those other studies say? A good recent one was published around the same time as the MigrationWatch study by the National Institute for Economic and Social Research (NIESR, an independent think tank sometimes describes as left-leaning but not convincingly). The full text pdf is here. In short, their approach to the issue involved rather more statistical analysis than MigrationWatch and they made a serious attempt to separate out confounding factors. They achieved this by looking at the unemployment and migration statistics in local authority regions. They also used National Insurance Number (NINo) registrations to measure migrant arrivals which is thought to be a much more reliable metric than the survey-based data used to estimate the gross numbers. This allowed them to compare local changes in immigration to local changes in unemployment giving a lot more insight than a gross country-wide number. The results show a very small negative and generally insignificant correlation between the migrant inflow rate and the change in the claimant count rate. ... Perhaps surprisingly, the interaction between migrant inflows and GDP emerges as positive and significant, albeit very small, indicating that during periods of lower growth, migrant inflows are associated with a lower claimant rates relative to the counterfactual - in other words, slower claimant growth than would otherwise have occurred. The claims of MigrationWatch are attractive given the public's naive view of economics but they rely on a simple correlation with little statistical support for any causality and little detailed analysis to verify the claim. The more detailed results from NIESR are both more consistent with the consensus of economic thinking and have much more plausible statistics to support them. They still don't prove causality, but they look much more convincing than the MigrationWatch numbers. In short, it is likely that there is no relationship of significance between immigration and youth unemployment in the UK in the last decade. Not the answer you're looking for? Browse other questions tagged economics united-kingdom immigration .